Reader Question: Should I pay off my student loan or car loan first? Many people are faced with Alberto’s situation every day. As the cost of college continually rises, recent graduates are faced with looming debt and limited employment opportunities. If you are lucky enough to find a job, your priorities should be setting up an emergency fund(EF) and paying off your high interest debt. Let’s dissect Alberto’s financial situation a little more carefully. Bob makes $50,000 a year. Using a loan calculator, we see that if Bob has a $20,000 student loan at 6% over 10 years, after one year he will have paid $1,159 in interest. Deducting this amount from his income gives us $48,841. At the 25% tax bracket, this will only save Bob about $290 on his taxes but Bob will still pay $909 ($1,159 – $290) in interest! This point emphasizes why if you have the money to pay off a loan, you should do it immediately. Financially, it makes the most sense to pay off your higher interest loans first. My recommendation to Alberto is to immediately pay off the entire 20k student loan. This will leave him with 10k in his emergency fund and a car loan of $11,000 at 3.25% for 5 years. Here’s where it gets interesting. Depending on your risk tolerance, you may want to dip into your emergency fund to help pay off your loan faster. Using our loan calculator on the right, we see that this loan will require a monthly payment of $199. Over a 5 year period, he will have paid $932 in interest. If Alberto is willing to take $5,000 from his emergency fund and apply that to his loan, he can reduce the total amount of interest paid over the life of the loan to just $283. Alternatively, he may also opt to leave his EF in tact, and double the payment every month to $398. This will cut the loan short by 2.5 years and reduce his total interest paid to $449. In Alberto’s situation, I would recommend dipping $2-3,000 into his EF to reduce the principal of the loan and then try to double the monthly payment. This will shorten his paid off date significantly, while still allowing him the flexibility of a liquid emergency fund just in case. 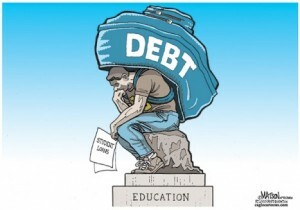 Do you have student loans piling up? Are you paying interest? Don’t forget to claim the interest you paid on your taxes this year. Great advice Harry! Did not know interest paid from student loans can be used as a deductible. Going to bookmark for later. Keep up the good work! Thanks! Remember, there is a $2500 limit on deductible interest, this will only come into play for large student loans though. Many thanks for sharing this…….